220+ kilometres of pristine coastal goodness. White sand, crystal clear/turqouise water and the most impressive lichen covered granite boulders you could ever imagine. I've said it before, and I'll continue to say it until I forget how to speak (type), Tasmania really does have it all. Freycinet National Park is just a short drive from the small coastal town of Coles Bay. Upon entering the park you are greeted with several striking peaks, known as 'The Hazards.' They're really quite hard to miss, and honestly, make an excellent backdrop for most locations within the park. This photo below was actually taken from the summit of one of The Hazards, 'Mount Amos'. Which has to be one of the best hikes you can do in a couple of hours in all of Tasmania. Not surprisingly, Melissa Findley and I opted to climb the summit for sunrise, which meant a 2:30am awakening. Nothing wakes you up quite like summiting a mountain first thing in the morning! Arguably the best way to see Freycinet National Park is by scenic flight. From the moment you take off, to the moment you land, you'll probably be speechless, I know I was - but that may have been because we opted to fly with the doors off.. We were put in the hands of presumably the coolest pilot around, Sam, who was awesome enough to do numerous laps around The Hazards and Wineglass Bay so we could "get the money shot." To be honest, I got the shots on the first couple of laps and just enjoyed the scenery during the last few, but that can be our little secret. 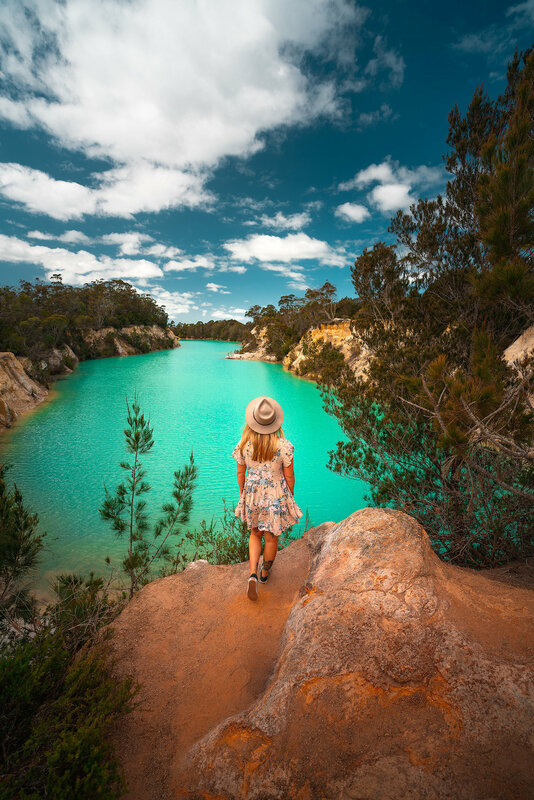 Whilst hiking to the summit of Mount Amos or soaring the skies above the peaks and pristine bays, there are quite a few more accessible locations within the park that are equally as impressive and most certainly worth exploring. The first image below is from Honeymoon Bay, and is only a couple minutes walk from the car park (or less from my room haha). The second image was taken from the outskirts of Coles Bay, but could really have been taken from anywhere within Coles Bay itself - I was just hunting for some tasty pink granite, orange lichen coloured foreground! And finally, the third image WAS actually taken from the summit of Mount Amos, but can also be seen from the Wineglass Bay lookout, and of course Wineglass Bay itself. Another beauty of being up so early for sunrise is that there wasn't a single soul on the beach. Although, one thing I've learnt about Tasmania is you quite often can end up having entire beaches to yourself! Remember earlier when I mentioned pristine beaches, vibrantly turquoise water and orange rocks as far as the eye could see? Well I think Mother Nature may have turned the dial to 11 for the Bay of Fires. And although we didn't have the best Spring weather in the world, below average conditions certainly don't mask the postcard perfect vibes along this stretch of coastline. We spent night 3 along the Bay of Fires which is located a little further North of Freycinet National Park, beginning at Binalong Bay in the South and stretching some 50km North to Eddystone Point. Having visited the area a few times before, I opted to try photographing a new (to me) location called 'Sloop Reef.' And I'll be honest, both Melissa and I kind of became obsessed with this beach. Maybe that's why 4 out of the 5 images I captured in the Bay of Fires was from Sloop Reef. With a lovely little camp ground, great beaches and a fairly decent surf break, I can see why this spot is popular amongst travellers. Our final ~24 hours was spent travelling to our final destination (Barnbougle), exploring the Barnbougle Dunes and eventually making our way back to Launceston Airport... we opted for the scenic route, obviously! Whilst I'm not much of a golfer.. golfist? I can certainly appreciate an attractive golf course when I see one and Barnbougle Dunes has got to be one of the most scenic golf courses I have ever laid eyes on. Surrounded by dunes, endless rolling tussock grass hills and coastline as far as the eye can see, it's not hard to see why it's made it's way onto countless lists for the worlds greatest golf courses. Unfortunately for us, the weather started to turn and I only managed to get a handful of shots from Barnbougle. One of which was probably during the best light of the trip (Melissa on the dunes, first image below). Our time in Tasmania was coming to an end, we packed our bags and made the last minute decision to hit up some more locations on the way back to Launceston. I always say (seriously, ask anyone), "it isn't a trip to Tasmania without a quick stop at my favourite waterfall... Liffey Falls!" And for now, that's all she wrote (or he in this case). Until next time Tasmania. You will forever be my favourite place to photograph in all of Australia. 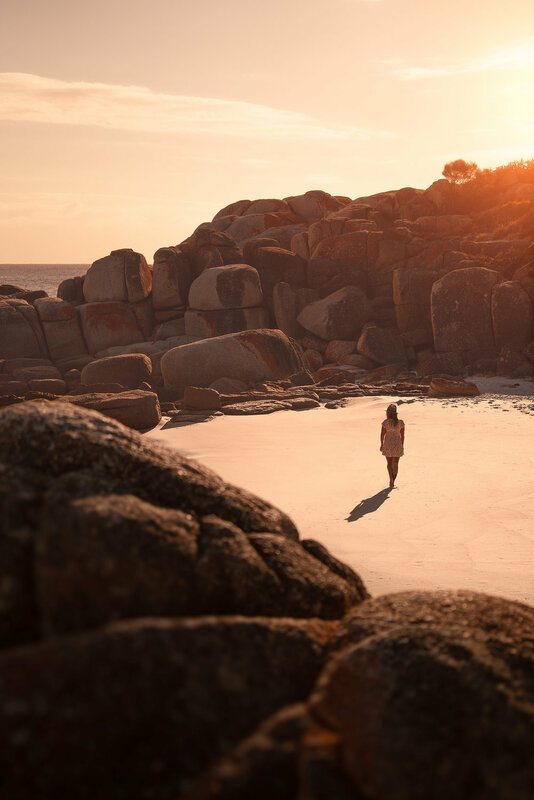 Huge thanks to Tourism Tasmania for the opportunity to once again visit this beautiful state and to Melissa Findley for helping out and featuring in a few (a lot) of my shots!